Bring 2 1/4 cups of salted water to a boil in a sturdy saucepan. Add rice and let come to a boil. Reduce to simmer and cook rice until water is absorbed and rice is al dente. Let cool completely. The rice can be cooked the night before and cooled overnight in the refrigerator. Preheat oven to 400 degrees. In a saute pan, heat Partanna EVOO, and add onion, garlic, and celery. Saute about 8 minutes over medium-low heat until vegetables are soft but not browned. In a large bowl, mix the rice with crabmeat, Garda Orientala EVOO, artichokes, capers, most of the lemon juice, almost all of the basil, pine nuts, and salt and pepper to taste. Place the hollowed tomatoes on a oiled casserole or baking pan. 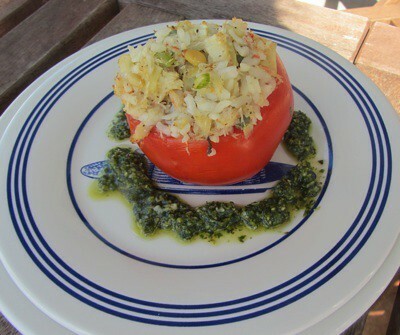 Fill each tomato with stuffing, mounding the top. Sprinkle tops with the rest of the basil, a squeeze of lemon, and a drizzle of Garda Orientale EVOO. Cover with foil, pinching the edges to seal. Bake for 30 minutes, then remove foil and bake until tops brown slighly, about 5 minutes more. Place tomatoes on plates, and garnish with more basil and a few pine nuts. Spoon Basil Pesto around each tomato.